This book considers the history, prophetic interpretations, and mainstreams idealogy of the Jehovah&apos;s Witnesses. The A to Z of Jehovah&apos;s Witnesses / George D. Chryssides. A to Z guides ; 104. $c Statement of responsibility George D. Chryssides. $c Date of prod/dist/manuf/copyrt 2008. 506 RestrictionNote $a Terms governing access License restrictions may limit access. 520 Summary $a Summary, etc. 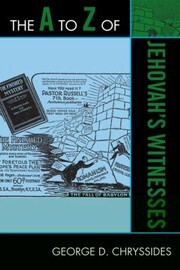 note This book considers the history, prophetic interpretations, and mainstreams idealogy of the Jehovah&apos;s Witnesses. 588 $a Description based on print version record. 655 IT:Genre 0 $a Genre/form data or focus term Electronic books. $t A to Z of Jehovah&apos;s Witnesses. $k A to Z guides ; Number 104.